Non-toxic liquid ink is hardened in a very specific shape, making a wax stick, similar to a crayon but far more complex in molecular nature. Each color for each model is shaped differently, thus making it difficult to install a solid ink stick into the wrong slot on a printer. When the printer is in use, the solid ink is actually melted back down to its liquid form and applied to the paper, where it once again hardens, but this time to make words and images on the page. How does it reduce waste? 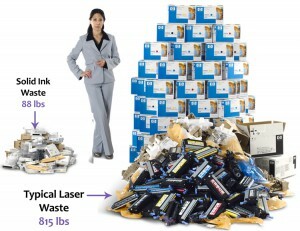 Beyond the boxes and shipping materials, inkjet and toner cartridges themselves create waste. When the ink or toner has been used and the cartridge is empty, it can be recycled and used again, though over 3 billion cartridges each year are just tossed in the trash. Ink sticks are considerably smaller than most toner cartridges and around the size of inkjet cartridges, thus minimizing the amount of packaging required to safely ship them to customers, and there is no cartridge to worry about. « What is an Imaging Drum?